Gilder Lehrman Collection #: GLC03635 Author/Creator: Grant, Ulysses S. (Ulysses Simpson) (1822-1885) Place Written: New York, New York Type: Autograph letter signed Date: 7 Jaunary 1881 Pagination: 3 p. ; 17.5 x 22.4 cm. 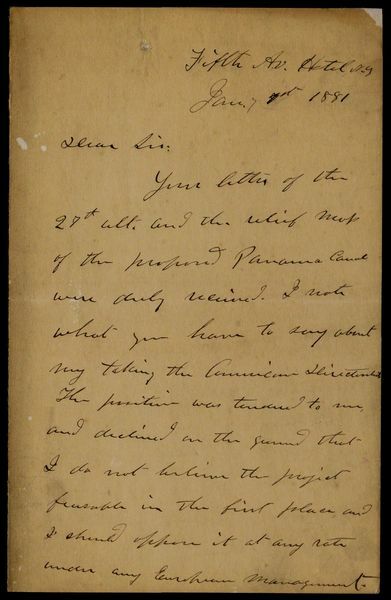 Summary of Content: Former President Grant replies to a letter received 27 December 1880 from Boston lawyer Nathan Appleton. States that all investments in the construction of the Panama Canal under European management will be "sunk without any return to the investors ... to say nothing of the human lives that would be sacrificed in its construction."